The Bender Optical site on Ludlow Avenue, which is jointly owned by Clifton Town Meeting (CTM) and the Clifton Business and Professional Association, is moving forward with the city's recent approval for the demolition of the Bender Optical building. The city has stated that the building will be coming down this Thursday (11/15)...thus clearing the way for the plaza to move forward. Following the demolition one more round of soil testing will be done, and then the site will be ready for the start of the plaza. 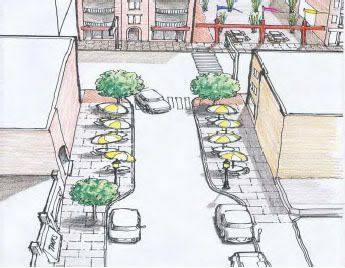 As for some background...the Clifton Plaza is part of the larger Ludlow Avenue revitalization project which will eventually include new sidewalks/curbs, added trees (where needed), improved streetlights, coordinated street furniture and the reduction of some overhead wires. 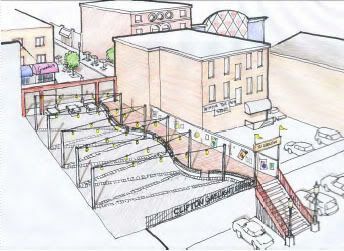 ***The images illustrate the proposed improvements to Telford Avenue, and the proposed improvements for the Merchant's Lot access. Both images are from the presentation PDF that is linked above. what's that area with the overhead lights? That would be the proposed Merchant's Lot Plaza...essentially the area that leads to the existing Merchant's parking lot. Sitwell's isn't gone yet...and they have fought to stay around before. I love Sitwell's. Is it the same designer that did the Purple People Bridge that did that plaza? i'm just skeptical because in the past, when i've watched efforts to improve a locale, they often end up destroying the very things that made the area great in the first place.